After our arrival in Predjama, we parked our car at the small parking space and walked short distance to the Predjama castle. What an amazing sight it was! Although the castle was a bit smaller than in my imagination, was no less impressive. 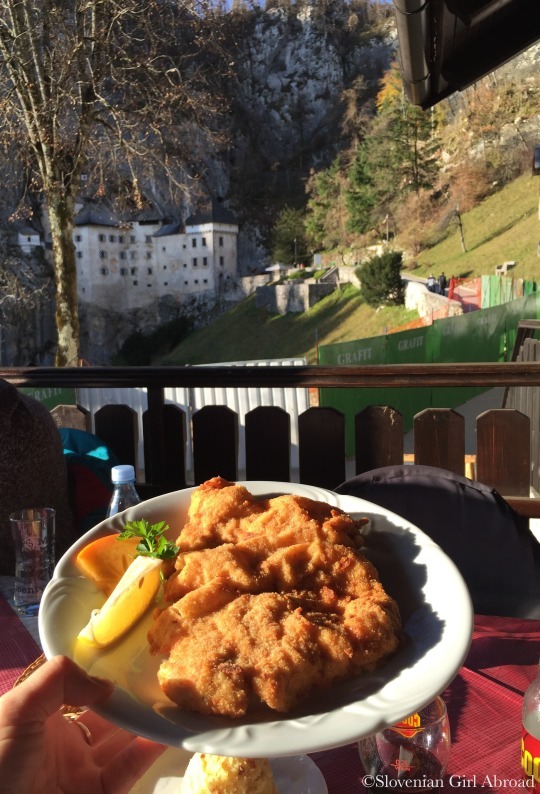 The first written document mentioning the Predjama castle dates back to 13th century. Since then the castle lived through history as a safe sanctuary and residence for different noble families until the end of Wold War II when it was nationalised by the authorities and turned into a museum. Back in the days, when the castle still protected its inhabitants from the enemy, there were no buildings and trees in the area around the castle. Bare land allowed inhabitants to spot the enemy faster. After paying an admission fee of 11,90 €, we received audio guide and were allowed to enter the castle. There is not a whole lot to see on the inside, but is still worth entering just to see how cleverly the medieval man used the natural resources to built this safe sanctuary. It’s impressive you can not really distinguish where the manmade walls and walls made by nature met. Most of the displays in the castle are reconstructing everyday life with a man-size dummies. It’s very decent old-school display that might not appeal to some of the visitors, but it still gives you a some sense of the everyday life in castle. 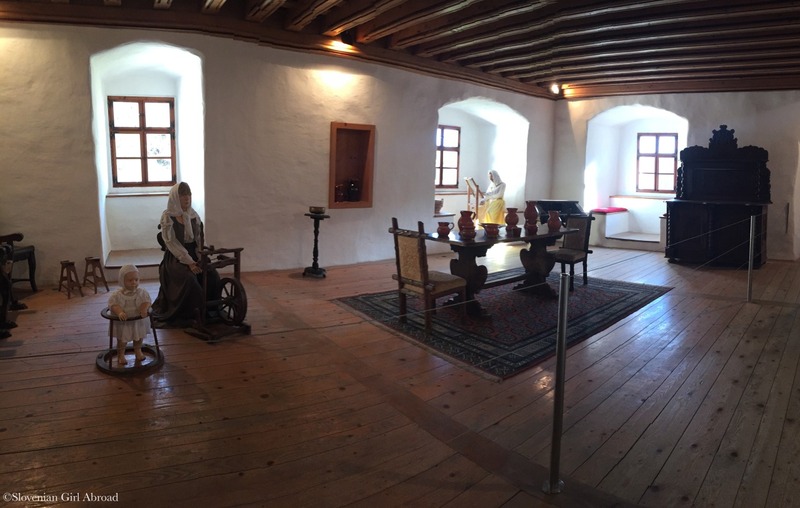 There are very few objects from the history of the castle put to display, but that don’t affect the visitor experience. The lack of objects is in my opinion successfully replaced with the self-paced audio tour with a head set. 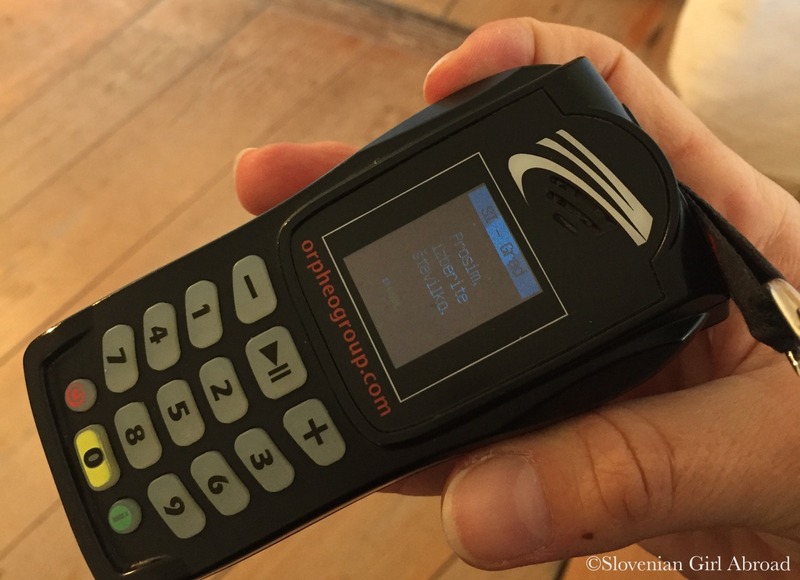 The set is easy to operate. I’ve listened narration in Slovenian language which is short and to the point and provides visitors with all the necessary information about the castle, its architectural features, history, legends and most famous inhabitants. Listening the tour was very interesting. I felt it brought the castle life. The audio guide is included in ticket price and is available in many languages: Slovene, Croatian, English, German, Italian, Hungarian, Spanish, Russian, Polish, Czech, Hebrew, Chinese, Japanese and Korean language. Especially interesting part of audio guide is the legend of the knight Erazem of Predjama – most famous of all Predjama castle inhabitants. Erazem was the robber baron who lived in 15th century. He was such an interesting figure, his life story inspired a legend celebrating him on one hand as a handsome, noble knight, and on the other hand as a bandit. The legend of Erazem has it, Erazem got into a conflict with the ruling Habsburg family. 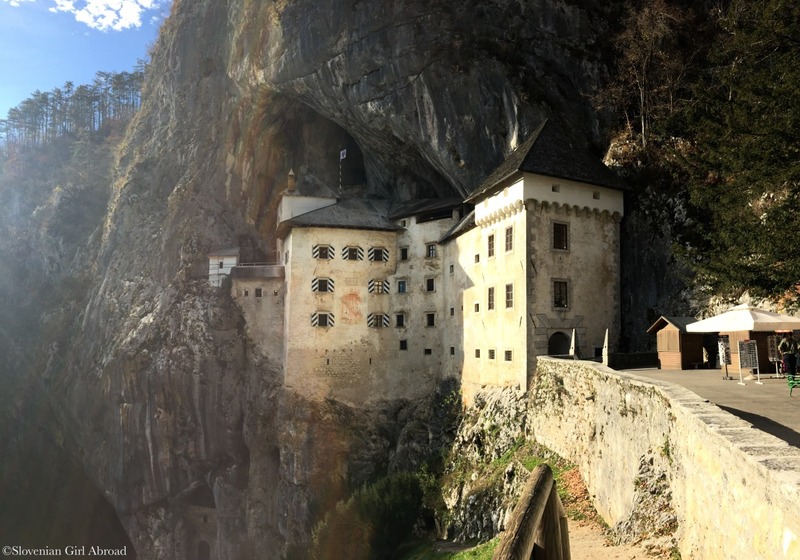 When fleeing from their rage, he found sanctuary in Predjama castle. 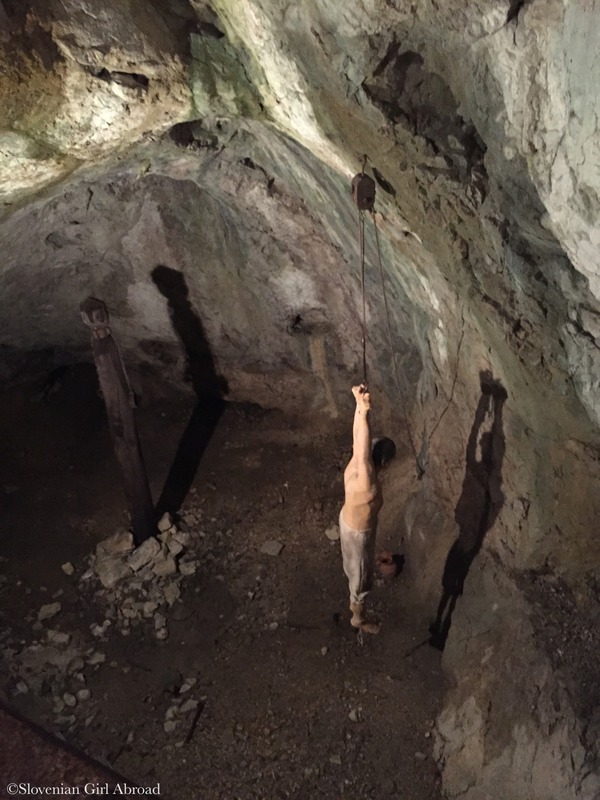 He, his men and family were able to withstood the long siege by receiving food and other supplies through a secret natural cave tunnel to a nearby village of Vipava. 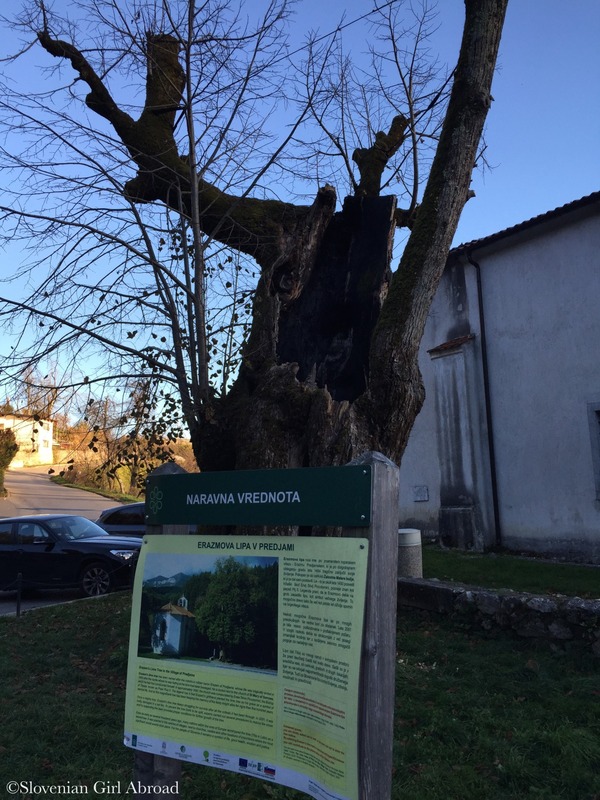 Vipava valley is famous for growing cherries. The legend has it, Erazem taunted the attackers by pelting them with fresh cherries from Vipava. The cherries nearby the castle weren’t yet ripped. The attacking solders could not understand how he was obtaining supplies. As far as they knew, there was only one way in and out of both the valley and castle. The rumour of the supernatural devilish forces helping Erazem spread around the attacking camp. The siege continued until the besiegers bribed one of Erazem’s servants. When his master was at the most vulnerable place of the castle – at the toilet situated on the top floor and the very edge of the castle, the servant signalled to the besiegers to fire a cannon. A single cannonball killed Erazem. The siege was soon over, but the legend of this rebellious knight lives on. Legend has it, Erazem was buried by the church of St Mary of Sorrows in near proximity to Predjama castle. His lady had planted lime tree on his grave as a symbol of eternal life. Despite the tree was badly damaged in a set fire in 2001, it is still there there, living and keeping Erazem’s memory alive. There is a nice restaurant right across from the castle. On a nice day you can sit outside, have a drink or a meal while enjoying the castle view. We did just that. The view was amazing and the food was decent. I had Wiener schnitzel with roasted potatoes which were not the best I ever had, but still good enough for me to enjoy my lunch. 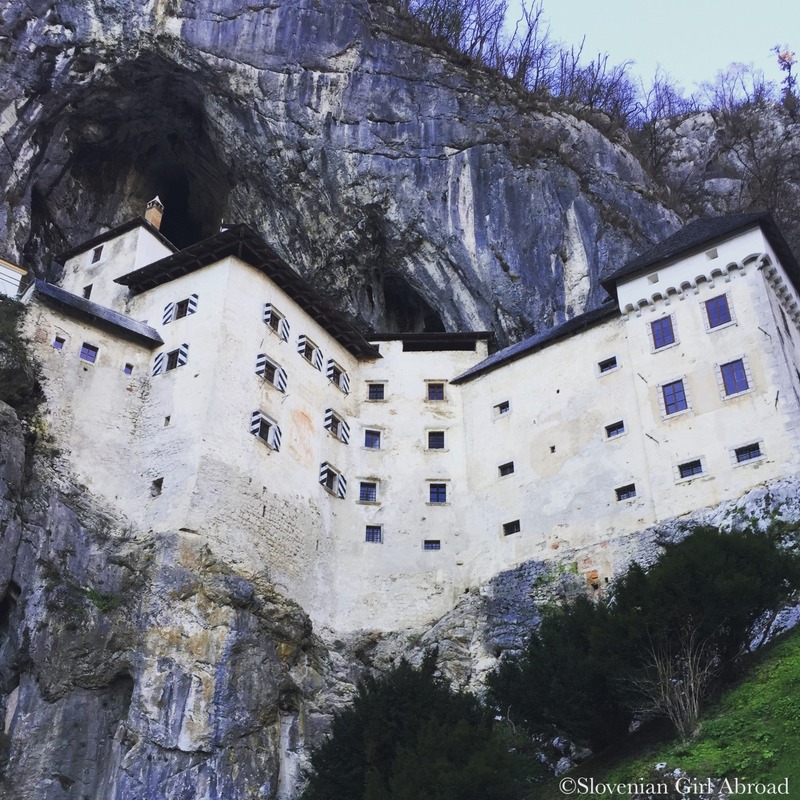 Predjama castle is a must to add to your list of things to see in Slovenia. 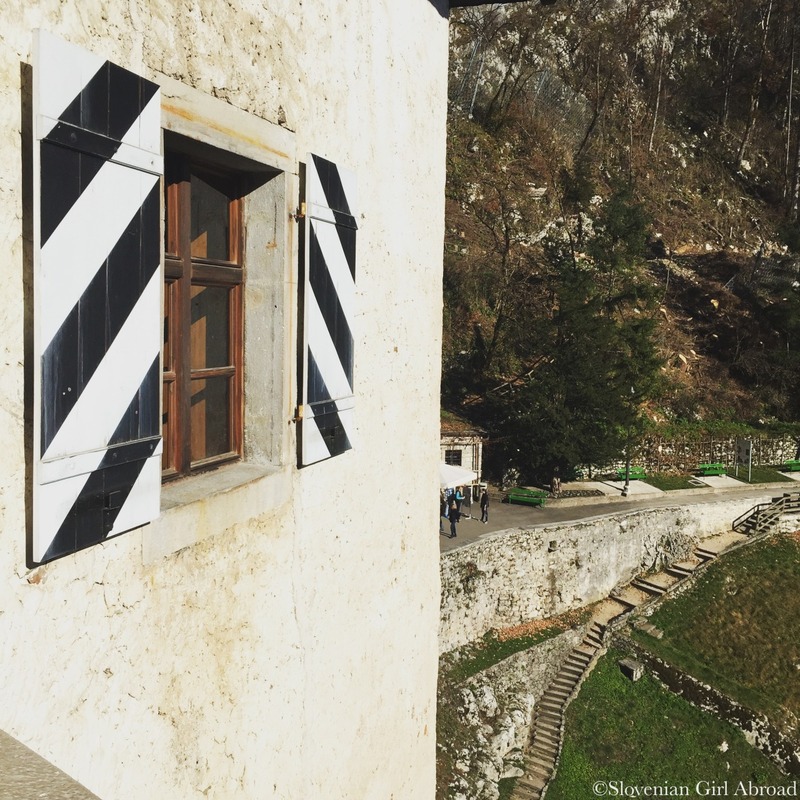 By car: At A1 highway take the Postojna exit and follow the signs for Predjama castle. Also visited and loved the story about Ezazem. Very limited parking there, although we were early so got a space for our motorhome … a tight turn though. 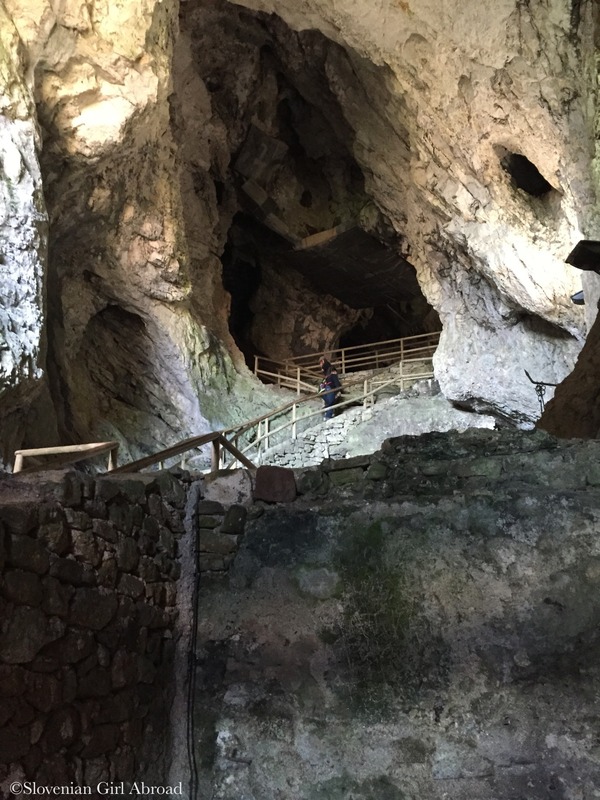 There is a shuttle bus that runs from the Postojna Caves, which may be easier for some visitors. You’re right, the parking space is very small, but when I was there it was almost empty. The reason is probably because it was off season. I’m sure it could be packed during the high season. The shuttle bus from Postojna could be a better option for some visitors, I agree. 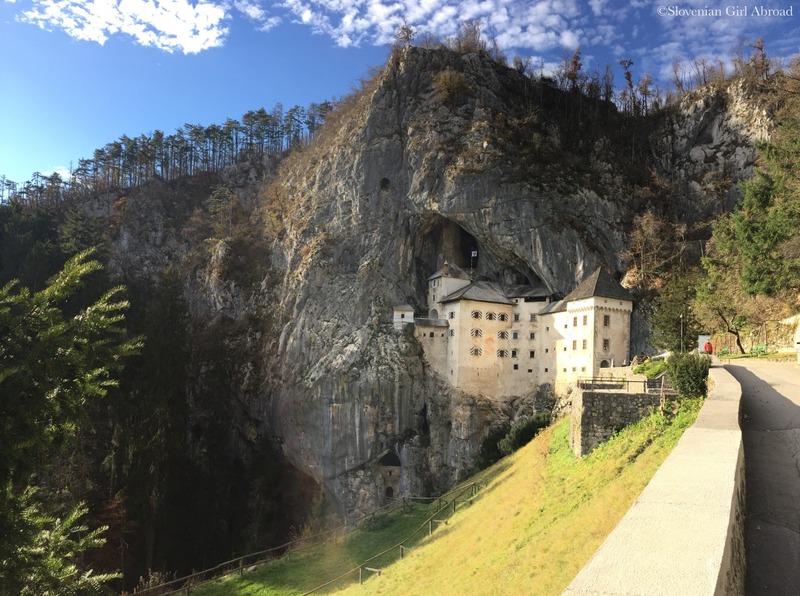 I think its even free, if you buy combined ticket for Predjama castle and Postojna cave. what a special castle – imagine building that thing! What a cool site to visit! I love castles especially when an audio guide is included. I’m such a nerd, but they have so many interesting facts! Thanks for sharing! This is fascinating! 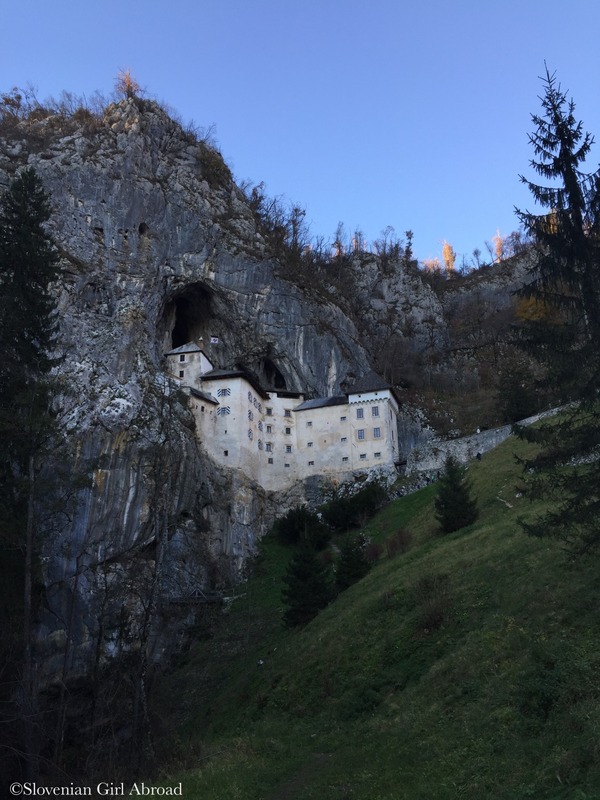 The Predjama Castle looks like the Temple in Bhutan that’s placed on the side of a mountain. Interesting to learn about Erazem and the legacy behind the story. 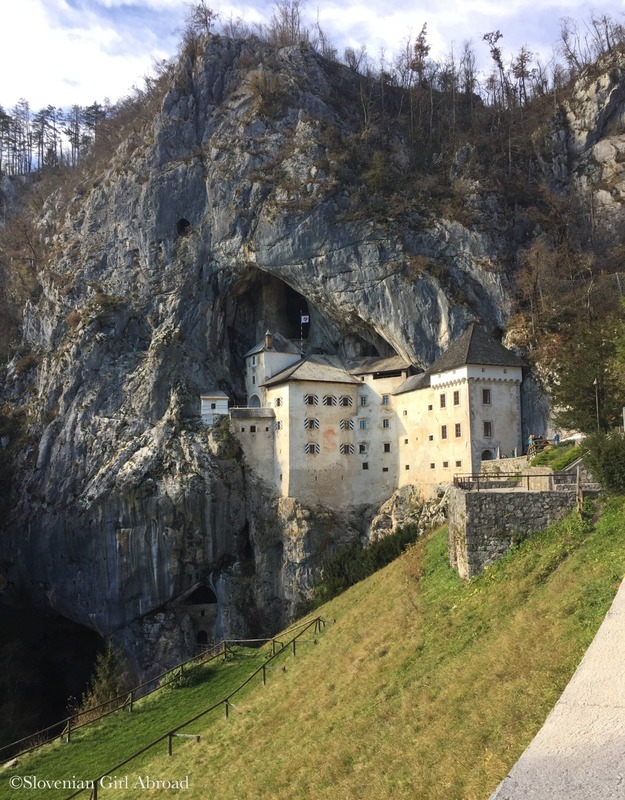 Enjoyed reading about your visit to Predjama castle. I would like to visit it when I visit Slovenia. What an interesting and beautiful place to visit!! It looks stunning and is yet another reason to put Slovenia on the list of places to go 🙂 Thanks for sharing! Predjama castle is a short drive from Postojna caves. It’s not that far away, but it cannot be seen from the entrance to the caves. I’m pretty sure it was these caves, but I was 13 at the time, so I could be misremembering. Oh yeah, it exists and is really cool place to visit. 😉 I agree, it is amazing how they built those massive buildings back then. By Postojna castle I found it especially intriguing they managed to built it in such a harmony with the natural features. Truly impressive. We are going to Postojna soon, and after reading your post we’ll visit Predjana too. It looks incredible! Thank you for the information! Awesome! I loved Predjama castle. I hope you’ll like it too! What other places in Slovenia are you planning to visit?